This is one iPhone and iPad app that the vegans and vegetarians amongst you are definitely going to want to check out. It provides an extensive database of vegetarian, vegan, and veg-friendly restaurants that you can easily search and see displayed on a convenient map view. I’m a diehard omnivore myself but I can definitely see the value in an app like this. Those of us with restrictive dietary needs and preferences can find it incredibly difficult and frustrating eating out at restaurants because many food vendors simply don’t understand or sympathize. There are, however, plenty of establishments who do go to the trouble of catering for, in this case, vegans and vegetarians, and the developer of this app has done a fantastic job of compiling many of them into an easily navigable collection. 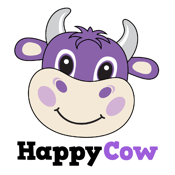 Veg Travel Guide for Vegan & Vegetarians by HappyCow features a fairly run-of-the-mill search facility that you can use to locate veggie and veggie-friendly restaurants in your local area, or in a new town or city that you may be visiting. This app also includes a huge collection of health food stores so that at the very least, you can find some convenient snacks to tide you over until you can get hold of a more substantial meal that suits your needs. All of the search results can be displayed on a very handy map, enabling you to easily find your way to even the most out-of-the-way establishment. There is also a handy Quick Browse mode which displays a selection of popular search terms you can choose from. If you’re planning a trip to a new town or city then you’ll be pleased to know that you can save establishments to your Favorites list and even create Hotspots to make it a real cinch when it comes time to track down a decent meal. You can also share all of the results you find with your friends and family online via Facebook, Twitter, email, and text message. This is a great way of letting other vegans and vegetarians know where they can sink their teeth into a nice meal at a decent eatery. Veg Travel Guide for Vegan & Vegetarians by HappyCow is simply a must-have iPhone and iPad app for the veggies amongst you who are planning to travel out of town and want to avoid the stress of trying to find a restaurant that understands and caters to what you really want.